How to create a video holiday card? If you want to create a memorable present for your family or friends, then making a video greeting card is a good idea. 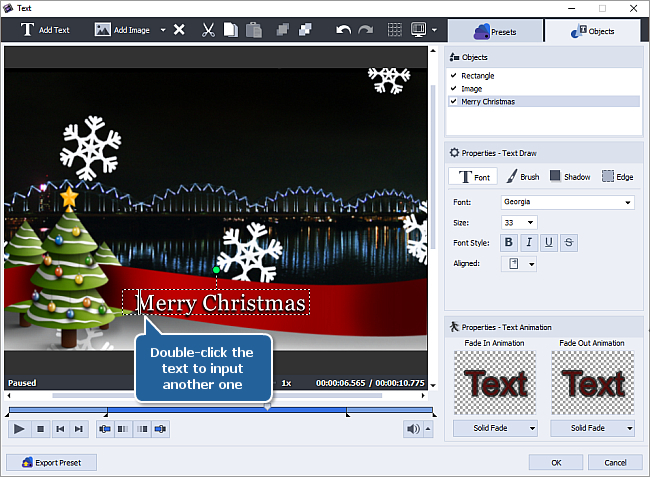 Using AVS Video Editor you can easily make amazing video cards or holiday slideshows for any occasion. Just collect suitable photos with those whom you want to congratulate, find videos with the most notable events, or record your video message, then apply different transitions, ready-made effects, insert text captions, add background music - and it's done! 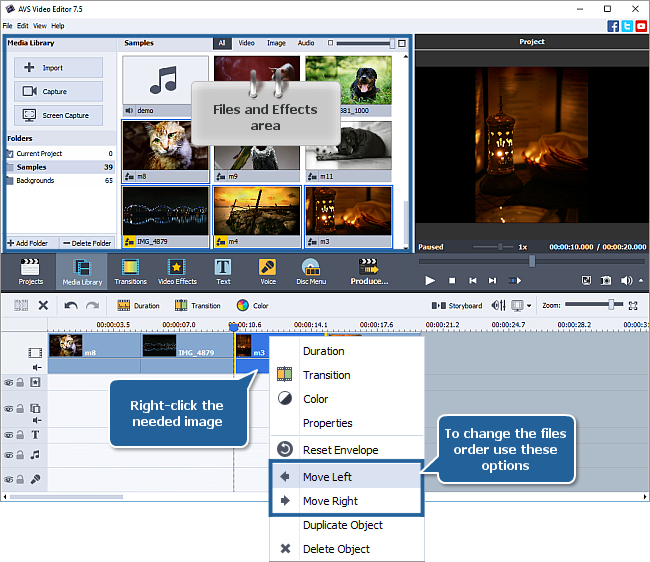 First you need to import images or videos into the program and add the files to the Timeline/Storyboard area. To set the necessary order of the images and videos, right-click one of them on the Timeline and use the Move Left / Move Right options from the right-click menu. Smooth transitions from one image to another will make your video holiday card more expressive. To work with transitions easier, switch to the Storyboard view using the Storyboard button above the Timeline. Press the Transitions central button to display all the available transitions. 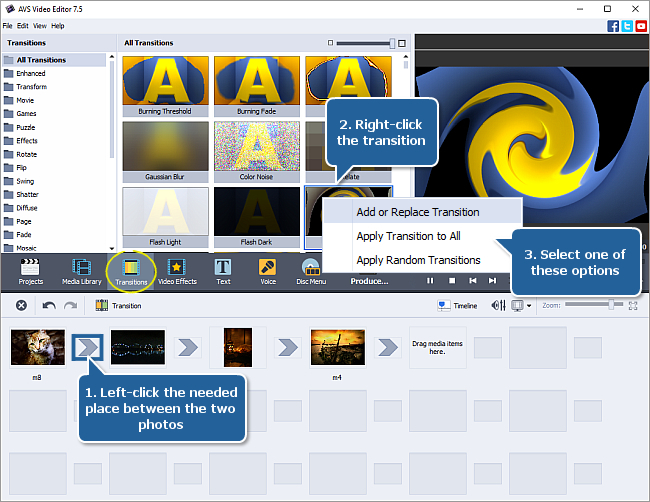 To quickly apply transitions between all images and videos, right-click any transition in the Files and Effects area and use the Apply Random Transitions option from the express menu. To add a certain transition, select the place between two images or videos on the Storyboard where you want a transition to be added, right-click the necessary transition and choose the Add or Replace Transition option. It's also possible to use one and the same transition between all your photos. To do that use the Apply Transition to All option from the right-click menu. For more details about transitions you can read this guide. Once you add all the transitions, press the Timeline button to return to the Timeline view. To make your video greeting card more attractive and fill it with holiday spirit, you can apply specially designed video effects. E.g. 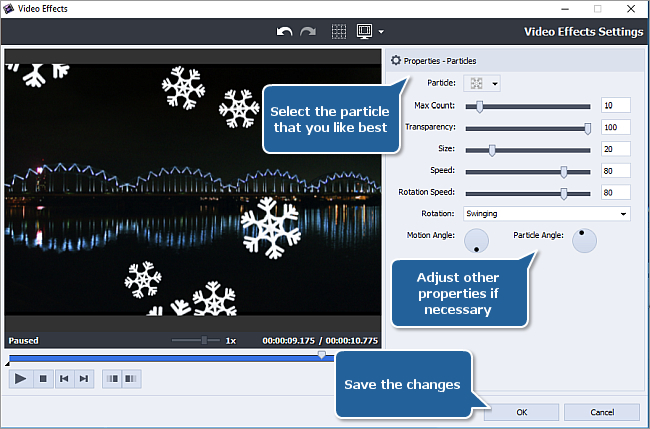 if you wish to create a video Christmas card, you can quickly apply the Snow effect. 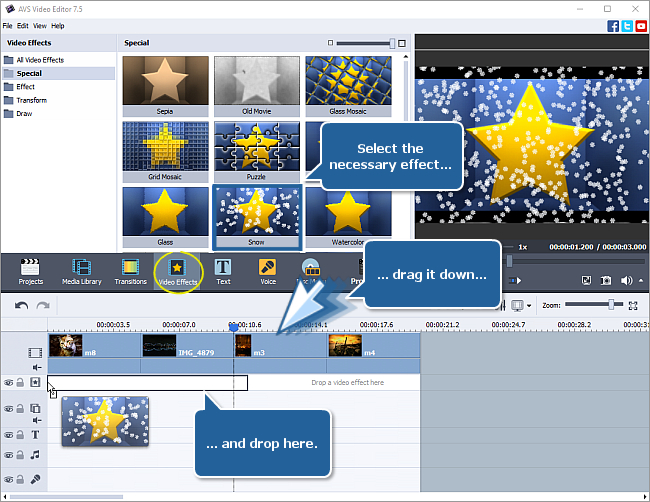 Click the Video Effects central button, select the Special effect group and drag-and-drop the effect to the Video effects row of the Timeline. To adjust the effect duration, drag its boundaries to the right or to the left. It's also possible to use the Particles effect from the Special group. This effect offers a great number of available options. Once the effect is added to the Timeline, double-click it to open its properties. View the available options in the Particle drop-down menu and select the one that you like best. It's also possible to adjust some other properties, e.g. the particle size, transparency etc. When ready, click OK to save the changes. To learn more on how to work with video effects please refer to our guide. Now you can add some text as a greeting card title or just write your congratulations and good wishes. For a Christmas card, you can apply one of colorful ready-made presets. Click the Text central button. Select the desired text preset from the Files and Effects area. 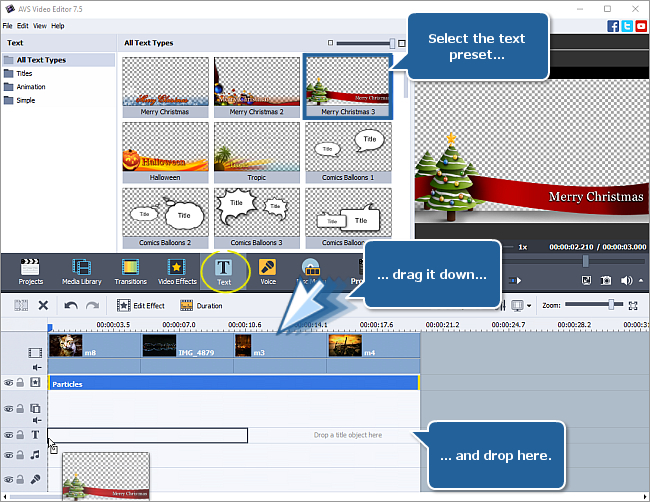 Drag and drop the selected preset to the text effects line of the Timeline. To adjust the text duration, drag the boundaries of the text block to the right or to the left. Double-click the text block to open the text properties window. In the preview area of the opened window double-click the default text and add or insert your own one. When ready, click OK to apply the changes. To learn more about the text adjustments you can refer to our guide. To add an audio track as background music click the Media Library central button and select the Audio category at the top of the program window. Drag-and-drop one of the previously imported tracks from the Files and Effects area to the line for audio mix of the Timeline. 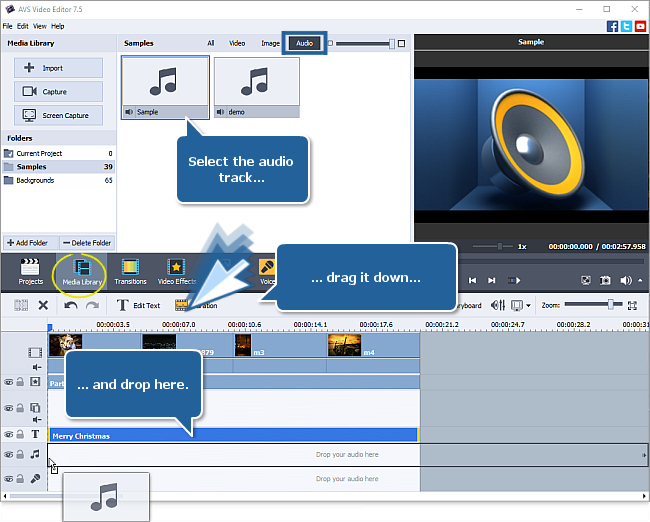 To learn more on how to work with audio tracks please see this guide. Finally, save the resulting video into an appropriate format. Now you can send the unique greeting card to your relatives or just upload it into social networks to surprise and gladden your friends.